Custom Val D'isere skiing badges for Amanda Pirie. 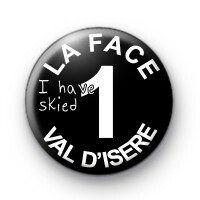 This badge is black with white text which reads La Face Val D'isere and hand written red writing which reads I have skied. Custom skiing badges for Amanda. 25mm button badges hand made in our UK workshop from metal components with a copper D pin back.